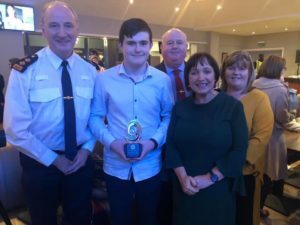 Fianna Fáil TD for South Kildare congratulated all the nominees and winners from the 2019 Garda Youth Awards in Punchestown last weekend. The Garda Youth Awards are one of my favourite nights of the year where we see incredible young people from around Kildare who have sown great leadership skills and in some cases have overcome personal adversity. From Kildare South these included, Concubhair McCabe from Newbridge attending the Curragh Post Primary school and volunteers tirelessly within his own school, local primary school, local estate ( Langton Park) and Community. Sean Molloy from the PBS, living in Kilbelin. Senior prefect, student leader , has an Gaisce awards, volunteers at Jumping jellybeans and is also a qualified lifeguard and first responder. Owen Sheridan, a Clongorey Young man who attends St Ann’s won a Special achievement award for all his personal endeavours. With jumping jellybeans, competing in the marathon, and Cill Dara foxes. Lauren O’Rourke from Rathangan, a proven leader in school and with first responders and the Monasterevan youth action who are doing incredible work in their own town around integration and community, and working on getting their own hall ready. South Kildare is lucky to have such a bright future with the youths living in our area. Well done to all the nominees and for the work you’ve carried out throughout the year to have been nominated for the awards.